When a person passes away, their estate is often comprised of probate assets and non-probate assets. Probate assets are assets that will be distributed according to the decedent’s Last Will & Testament. These assets are titled solely in the decedent’s name. Totten trust accounts, Payable on Death accounts (P.O.D.) or In Trust for Accounts (ITF)- These accounts allow a person to control their funds and when they pass away the beneficiary listed on the account will receive the funds upon their passing. The beneficiary listed will have to show the bank or brokerage a death certificate to receive the funds. Retirement Accounts- Retirement accounts should have beneficiaries attached to them. 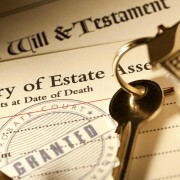 They will pass outside the probate estate unless there is not a beneficiary listed. To recover the retirement account the beneficiary listed should provide the retirement account company with a death certificate. Life Insurance- Life insurance proceeds pass outside of the probate estate if there is a beneficiary listed. The beneficiary would need to file a claim form and a death certificate to receive the funds. Jointly Held Property- Joint accounts pass automatically to the survivor of the account. Real Property that is held as Joint Tenants with Rights of Survivorship or Tenants by the Entirety- These properties pass automatically to the survivor. The survivor should file a deed to clarify the chain of title. For more information on how real property can be titled, click here. Trust Property- Property that is funded in a trust will follow the terms of the trust and pass outside the probate estate. The trustee must follow the terms of the trust. Daredevil Dan went to the Bronx to watch the Yankees play. He was too engrossed in his bucket of chicken fingers at the game and was struck by a foul ball, and that was the end of Daredevil Dan. Daredevil Dan went to Ira K. Miller & Associates and executed a Last Will & Testament. Daredevil Dan had a joint bank account with his wife, Brittany, with $25,000 in it. He had a retirement account with $100,000 which had his wife designated as his beneficiary. He owned a property in Red Hook solely in his name. He owned a property in Park Slope with his wife titled as tenants by the entirety. He owned a brokerage account worth $20,000 which was titled in trust for his son, Thomas and he owned a bank account with $40,000 in his name alone. According to these facts, the non-probate assets that would go to Brittany would be the joint bank account for $25,000, the property in Park Slope, and the retirement account with $100,000. Brittany should have the deed for the property in Park Slope changed solely to herself as surviving tenant by the entirety. Thomas would be able to collect the $20,000 from the brokerage account by providing them with a death certificate. The probate assets in Daredevil Dan’s estate would be the property in Red Hook and the bank account with $40,000 in Daredevil Dan’s name alone. The disposition of this property would be controlled by Daredevil Dan’s Last Will & Testament.